“Nanomaterials can convert carbon dioxide into useful products like alcohol. The materials could be simple chemical catalysts or photochemical in nature that work in the presence of sunlight,” Everybody should love the approach, even whisky distillers. Imagine all surface water on the Earth turned into a 0.04% alcoholic drink. The next step is a self-driving car running on alcohol. That’s a fair description of mine once in a while around 2AM on a Friday or Saturday night out at the local watering hole. Solar geoengineering. A particularly stark example of bad assumption piled on bad assumption. Start with RCP8.5, then pile on swag after swag. Conclude by urging more spending on more ‘research’. Utterly daft. With regards to the link on higher Holocene temperatures and higher global sea levels 5000 ago, I get a sense of deja vu all over again. We knew all this stuff decades ago but have ignored it. It is in the papers and books of various libraries and archives which sadly are rarely visited these days as scientists mostly seem to rely on models and material that has not been digitised. Sea levels rise and fall according to prolonged periods of warmth or cold. The effective height is often masked by what the land is doing as it rebounds or sinks. Levels sank again during the intermittent little ice age. they have started to rise very marginally again over the last few hundred years as the LIA came to a halt around 1750 or so. However this is all anecdotal and we wouldn’t want any of that to contradict our nice robust models would we? It’s just Milankovitch. That warm cycle peaked by the early Holocene, and it has been downhill since then, and should still be, but we started heading rapidly towards a CO2 doubling, which quickly overcame the relatively weak Milankovitch forcing. Except it doesnt contradict the models. It doesn’t contradict the models because the models are unable to reproduce early Holocene conditions. Yet somehow we should trust that they are capable of anticipating conditions in 80 or 180 years. What was the Holocene Climatic Optimum (7,000 years ago) global average temperature according to models given the known CO2 concentration at the time, Steven? You can give it in anomaly if you prefer. You trust your models of the Holocene. It doesn’t contradict known science. I think climate scientists understand why the early Holocene would be warmer then cooling gradually. The sudden uptick in the last century is clearly a different mechanism from that, and they understand that too. Liu, Zhengyu, et al. “The Holocene temperature conundrum.” Proceedings of the National Academy of Sciences 111.34 (2014): E3501-E3505. In my opinion the physical mechanism is quite clear. Models are too sensitive to CO2 and too insensitive to solar forcing. But what would I know? Only that they also don’t know but have the hubris to tell us they do. That you believe in them is fantastic. Unless you are a skeptical scientist, you need to believe in something. It is a profound human need unless you train hard to extirpate it, and you just have found your faith. Javier, I certainly have a different view. Yes, the Milankovitch cycles are well accepted and their mechanism largely depends on the favorability of orbital parameters for Arctic sea ice and Arctic glaciers in general. That theory would explain the Holocene decline in terms of precession favoring Arctic sea ice more as we get closer to the present, other factors being equal. The seasonal variations of Arctic sea-ice coverage are apparently a very delicate part of the climate system, but the positive albedo feedback is also very important, and models continue to have problems with predicting its coverage especially on time scales of millennia. There’s a balance. Either the models will not hold on to it, or they won’t melt it enough. Ocean circulation changes are part of this problem too. I think this is the source of the problems in getting the Holocene cooling correct. By comparison, the sub-century effects of CO2 are more immediate and well understood, at least until they too start to affect ocean circulations. No Jim D, you fool yourself on this. They are not well understood, because nobody has been able to measure the heat produced by greenhouse gases versus the heat produced by natural causes. The reason is that heat is just energy, and nobody knows the amount that it is coming from different sources and from within the climate system. Everything is assumed. That is enough to convince you, but it does not convince me, because it does not constitute knowledge. In any case I don’t get anything out of talking to you. You are a believer that simply looks for arguments to reinforce your belief and brandish against skeptics. It is a complete waste of time and I don’t like to waste my time. So you can choose to respond to Robert Ellison comments instead of mine. Javier, the surface greenhouse effect which stands at 33 degrees has been measured and quantified in terms of known physics. You can claim that you don’t yet understand it, but science does, and it is just textbook stuff, degree-level physics. 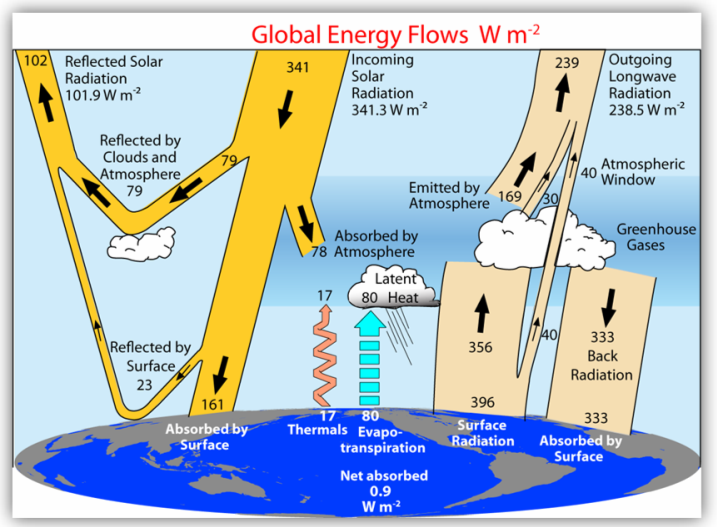 There is no mystery why the earth’s surface is that much warmer than it would be without GHGs. Your response just demonstrates you don’t understand the issues I talk about, that have nothing to do with the role of greenhouse gases in the atmosphere, of which water vapor does almost all the work. This role is affected by so many factors as to make impossible at this time to determine the contribution of the added greenhouse gases to the observed warming. It has simply been guessed. If you don’t understand that then you don’t understand anything. Javier, you have yet to show that you even understand what we do know about the quantifiable aspects of the greenhouse effect, like the 33 degree effect on the surface temperature. That 33 degrees cannot be explained without CO2 at its present concentration, and it is sensitive to changes in that. These things are tied together and cannot be separated. Jim D – please link to a “surface greenhouse effect at 33 degrees”. Your link should take into effect the effects of day and night, and the effects of winter and summer. And how about water vapor? The radiative equilibrium temperature of a spinning sphere with an albedo of 0.3 at this distance from the sun is calculated as 255 K. The earth’s surface temperature is more like 288 K. Hence 33 K difference. This is because of the insulating effect of GHGs. Does this surprise you? What number do you get? Jim, on my planet nights are cooler than days. Winters are cooler than summers. You are a typical flat-earth modeler: The earth is a flat circle illuminated by a 1/4 insolation day and night. Where I live, a difference between a hot summer day and a cold winter day is 50 degrees. Your glorified estimate does not impress me. CG, the earth gets a net 240 W/m2 from the sun and the earth has to radiate that amount in the infra red. The temperature needed to do that is 255 K. That is the effective temperature at the top of the atmosphere. At the surface it is 288 K due to the greenhouse insulation effect. It has to be warmer at the surface because the atmosphere does not let it through easily. If you know how insulation works, you will understand how this gradient is maintained when the heat outflow is blocked. If it wasn’t blocked, the surface would be 255 K instead. If you want to take into account days, seasons and latitudes, go ahead, but you get the same GHG effect when averaged over the year and the surface. “If you want to take into account days, seasons and latitudes, go ahead.” Exactly. I don’ believe in flat earth. I believe that temperature swings are larger in deserts than in a middle of the ocean. You have oversimplified the problem. You can only calculate in a fantasy land. CG, Arrhenius took latitude variations into account and got the same result. You think you’re better than him? Go ahead and do your calculation your way. You won’t disprove the greenhouse effect that way. Jim, I don’t want to disprove the greenhouse effect. I want to see a good proof of it. Excuse me, not a proof. A good calculation of the magnitude. How about a picture? You see that 333 W/m2 labeled back radiation? That’s the greenhouse effect. It is directly measurable, and larger than the solar input at the surface. Is its measurement proof to you or do you need something else? You decided to major in English fiction in college, and did graduate work in English fiction. You didn’t choose to major in physics, chemistry or biology. What drove your decision-making? Then you hooked up with Richard Mueller, who created “Physics for Future Presidents.” His lectures are on youtube. Mueller jumped into the socie-marxists’ camp who demanded that science students take their humanities and social science courses, and when science and engineering profs and students complained, retorted, “Well, socie and humanities students have to take math and science courses, so it’s fair and balanced,” invented a fake “”physics” course. You hooked up with the fake “physics” course prof. I completed the real physics, Berkeley Physics 7 sequence, with grades better than Mike Mann, which you would have flunked at age 19-20..
It’s funny how much that was considered noncontroversial a couple decades ago had to be revised or ignored to support the new funding climate. Rigor is no longer de rigeuer. You can look up articles where folks at MIT used to laugh at climate models in the press. Today, people are wont to confuse them with hard facts, to the point they think the greenhouse effect has been measured right down to single watts. Re :Dan Sarewitz: stop treating science denial like a disease. Climate Science is the grandest science of all. How could I not see it. To doubt Climate Science is to doubt ALL of science. Gaia has blessed us with a science that was birthed in purity and thus able to achieve the Enlightenment of Consensus. I apologize to all the other sciences for my denial of Climate Science. Andy, I thought the same thing about Sarewitz .. at first.., but the more I thought about it I realized it was another way of saying ‘the science is settled’. Since he is a professor of Science at ASU he seemed to know better than to use the algorism. I checked. His was a nice way of pointing out how to deal with nut jobs. It reminds me of Alfred Russel Wallace venturing into spiritualism much to Darwin chagrin. Sorry that last sentence was a dangling participle. It (the article) wanders into spiritualism. When Wallace became a spiritualist the 19th century public viewed it as spiritualism being spiritual or religious. This author wandered into spiritualism knowing the public views it as a religion. As usual, you have to be careful with “notrickzone” headlines because they distort what the paper actually says to fool the unsuspecting. The MWP study was just China. Also was it the first study to find an MWP in China contradicting previous studies? Was it the latest of many, and therefore no surprise? Was it the first such paleoclimate study in China? Context needed. I get that it is only China. But there are other studies showing Warm anomalies in other regions of the world. In a few years there will be other studies in new locations that will, as a minimum, tear down the argument that there was no warming, to some extent, globally. Given the error bars on studies covering temperatures 1000 years ago, any indications there were warm periods in any locations should prompt reasonable people to ask the obvious question, is the current Warm Period really unprecedented. I don’t think 1 study or 50 studies proves anything, either way. But when evidence continues to build that there were some kinds of warm periods, the slam dunk certainty that exists in some quarters doesn’t seem justified. PAGES2k collected a few hundred proxies globally and don’t show much, if any, of an MWP against a general cooling trend through that period. A few more won’t turn that result around. Anyway, point is, don’t believe the headline. That wasn’t the paper, that was the ironically named notrickzone doing their tricks again. No the current period warthm is no unprecedented. However, it is the first time Human action has caused temperatures this high. No matter How warm the MWP was, no matter how widespread, the physics remains the same. More GHGs cause more warming. Papers about warmth during the MWP go back to the last century. aIt would be very easy for skeptics to demonstrate temperatures then are as warm as nowish. They never get around to it. Why? Think about it. Even if true, it don’t change a thing. There are local warm periods all the time. The US had a warm period during the dustbowl and the skeptics somehow take comfort in that. Here’s a global map of MWP studies. Red pins show studies that found warmer conditions. Yellow is drier, green is wetter, and blue is colder. Jim D – the 30’s in the US were part of a global warming trend. It wasn’t local. Sure, but the US was one of the warm spots that helped the global average. So the US dustbowl was an exceptional time, even compared to what the globe was doing in the 30’s. Other areas were not having an equivalent. The warming was regional. The warming was global, JimD. Of course, you can make up anything you like. The dust bowl happened during the early leg of the global warming trend. Just like all those Little MWPs added up to a global warming event. I showed you the map of the 1930’s relative to the 20th century average . You call it global. Sure. The average global temperature is rising at present(as it has been for some 300 years) but that misses the nuances of one third of the globe that is cooling or static. So currently, warmimg predominates despite those nuances. In the LIA coldness predominated but there were lots of places that bucked the trend. In the MWP again it is doubtful oif the whole globe was warmimg but it was predominantly so. Wth all three examples there are many counter trends going on as for example there were some very warm periods during the LIA. Tonyb, I don’t know what your claim is based on. This is the warming of the last decade versus a 1951-1980 baseline. It’s pretty much all warming. JimD – Here’s the global temp record from 1925 to 1945. Looks like a global trend to me. Or do you now believe warming can’t be global? I have posted here before that some years ago I set out to look for cooling stations and found hundreds. I emailed dr mueller shortly before the berkely report came out and said I reckoned some quarter of the world showed cooling, he said he reckoned a third. This is the cue for mosh to pop up and say they are statistically insignificant. I have in the past suggested it would be a fascinating study for him to identify the cooling ones and illustrate in this way how statistically insignificant they are. tonyb, for individual stations trends are hardly ever significant because there is too much noise. As they say in the article you linked, you need to look at larger areas for a signal to emerge. The larger the area the better. The people who did CET knew that much, and did not use only one station for that precise reason as that would have been less than useless. Michael Crichton used individual station records to make his case in State of Fear, and some were fooled by his cherrypicking into thinking it was some kind of cover-up. A lot of these single-station sampling issues are just now being rediscovered by the skeptics, but I think they are getting there finally. When planning for your city, would you use the GMST data or the local weather station data? Ragnaar, you would plan based on regional trends, not global ones because they don’t represent your region, and not station ones because they are too noisy, right? For example something like this is a guide because it gives your region in a global context. “I emailed dr mueller shortly before the berkely report came out and said I reckoned some quarter of the world showed cooling, he said he reckoned a third. Once again tony is misrepresenting what Muller was talking about. Once again he is flat out lying about what I would say. I will keep this simple. Imagine there are three stations. of their start date or end date. raw data over longish periods. I’ve explained this a dozen times to tony. quite literally a bald faced lie. that station. !e distribution of these trends can then be examined. 1. Look at all the record. 2. Use raw data with errors in it. 3. Take records that are longer than 30 years. 4. DONT consider when they start or end. 5. 24% will be cooling. 6. This cooling may or may not be significant. you will end up with zero stations cooling even in raw data. The study, actually titled ” Climate-driven variability in the occurrence of major floods across North America and Europe” didn’t confirm that at all. It found there were increases in flooding, which were mostly not statistically significant. That is because floods are rare events, not easily modelled by statistical distributions, so there is a lot of uncertainty. So you can’t rule out that the observed increase couldn’t be just a chance occurrence. That is quite different from confirming that there was no increase. You couldn’t rule out that there are more people to observe them in the first place, or to report them for insurance purposes, or to have caused them by demanding to live on known flood plains or for the authorities to have contributed to them by wanting to protect wild life-not people- and not keeping rivers dredged. The paper referenced here studied reference catchments. These are, as best possible, catchments with little urban development (<10%), little damming, and few drainage improvements. Very good luck with finding catchments that have not been altered in those areas during the study period. Its a shame they made no attempt to look at the flooding situation on flooding prior to 1961 which is well within living memory. My data base of weather events going back to 1086 (sporadically) and around 1150 in more depth (pun intended) shows that rain and flooding are the most frequently mentioned occurrences and they are often of a biblical and landscape changing nature. Flooding? Eee lad, when I were a boy, the flooding now would be seen as no more than a puddle. Those today don’t know they’re born…. Nick, don’t let the other true believers hear you talk about uncertainty or how it is difficult to statistically analyze occurrences of flooding. Because they know flooding is increasing and becoming more intense. You haven’t moved to Otago NZ to escape the heat. Steve Mosher hasn’t moved to Fairbanks AK to escape the heat. Why not? Because you know you aren’t personally affected enough by climate warming to move yourselves to cooler climes to survive tha change. You know you are full of sh*t, because otherwise you’d move towards the cooler poles to save yourselves. Even Mike Mann has settled south (closer to the equator) of where he grew up. Jim Denial at his best. So what if the study was just for China. You true believers have constantly harped on the MWP only applying to Europe. No it is not the first study indicating a warmer climate in China, nor contradicts earlier research. The context is that there is science research which you try to discount because it runs counter to your storyline. The MWP existed in various regions at various times. It just wasn’t global at any particular time. I think you can accept that. This is the actual true believer position. It is false. There have been studies dating back to at least the mi 1990s about warmth in China during the MWP. These studies were done by climate scientists. They have been done all over the world. Put them all together and you get exactly what Jim D says, which has been where the issue came to rest a long time ago. It would be very easy for a skeptic to knit it all together in a grand-slam paper. They either can’t or won’t. Why? Perhaps they prefer their myths. What I can except is you might go to the cross, so strong is your belief. Your logic and your science, not so much. São dois ficheiros diferentes: um não tem extensão, o outro tem extensão .txt. O que vais fazer é apagar ambos e em seguida colocas nesse directório o ficheiro que vai anexo a esta mensagem. Ignora os das mensagens anteriores. É crítico este ponto do ficheiro “hosts” e o que lá tens (o que não tem extensão) não serve, no entanto o “hosts.txt” não me parece mau, mas não é usado: este ficheiro não pode ter extensão. Creio que no Windows Explorer há no menu umas “Opções”, ou algo assim. Por aí podes configurar o Explorer para te esconder (configuração de fábrica) ou revelat as extensões dos ficheiros: deves accionar esta função, para poderes ver o que estás a fazer. I had not realized these things are connected. The police have the money to remove pipe line protesters. And Native American reservations are part of systematic racism and at least one pipe line is/will be nearby. And unless they have highly profitable casino and a small tribe so that each cut is larger, they could use some more social services. How to fix all four things in one fell swoop? No pipe lines and use the money saved by spending less removing protesters for social services on the reservation. Isn’t Norway with all its fossil fuel money a pleasant place to live? It seems their police may carry guns but it seems that’s a recent development. And they don’t kill many people it seems. Connecting the dots was the theme of the film A Beautiful Mind. Isn’t human activity part of a natural force? Human activity is natural but is our technology a natural forcing? It’s not natural to clear land of trees and farm it or to burn wood to cook and for warmth. Because it is another proven scientific fact that humans are vermin introduced to this natural system by aliens. Bad anthropoid. BAD! Act more natural. Looks like technology. Then overuse of the water and growth of their population. Then a bust. That water isn’t there because it was extracted and used to grow crops. It’s not a problem of climate change. We can blame technology. Poor control of their water resources. Failed planning. Same problem with Syria. The country went from 6 million in 1960 to 22 million in 2011. Same cause: Oil exports allowed huge population expansion by increasing economic resources and decreasing mortality. Then peak oil was reached and oil exports ended. Same result: Lack of sufficient economic resources and civil war. The agricultural expansion on unsustainable water extraction accompanied the process, but the same result could have been achieved buying food. Saudi Arabia initiated a cereal expansion program on underground fossil water from the last Green Sahara period and had to end it because it was completely unsustainable. But they still have oil so they still can feed and provide economic resources for their population by importing goods. It will be one of the worst places in the World to be when they reach their peak oil. Something that could happen sooner than most people anticipate as most of their reserves exist just on paper. The process is well known in biology. It is called overshooting. It affects every living organism, from bacteria to plants and animals. The part of the process when the overshooting sets in and the population level becomes unsustainable and has to crash is no fun at all. Yemen and Syria reached overshooting. A significant part of their population will have to be accommodated elsewhere. But few Muslim countries accept refugees. You never heard of population explosions and crashes in other species? Paper also says ‘relative sea level rise’, not absolute, as do most of the papers cited in the article. None of the papers include error estimate or bars to account for the effect of continental uplift, which most overtly acknowledge. All the paper is saying is that they have found marine fossils above sea level. That’s nothing new. The highest mountain on the planet have strata containing marine fossils. An equally valid argument can be made that the ‘relative sea level’ change is an indicator of the geological rise of the continental land. That’s why it’s described as relative. It is a collection of 23 papers from all over the world, all of them about Holocene high stand at each place. One thing is clear, sea level was higher at the HCO. Hard to say how much, but difficult to defend that it was less than 1 meter higher than now. Probably 2-3 meters is a good estimate. Only if you believe we have reached or going to reach HCO temperatures for a very long period of time. Glaciers are not nearly as reduced as during the HCO, and SRL rate of increase suggests several centuries for 1 meter increase (0.3-0.4 m by 2100 according to IPCC, 0.2 according to gauges). Current insolation profile is not helpful for a significant Greenland melt. And on top of that is the assumption that the warming is going to continue indefinitely. The Pause already showed that assumption is incorrect. During interglacials warming periods last a few centuries and ours is already ~ 400 years old. If the CO2 hypothesis is incorrect our warming could cease in less than a century. So the only certainty here is that we don’t known what future climate we are going to have. Would it be fair to summarise your contention as Holocene high stand RSL at +2.0 m +/- 1.0 m? That would seem to cover the variability of SLR in the papers. I don’t take this perspective to be antagonistic. It an important issue,. SLR is one of the foundation issues of CAGW science. If it can be shown that Holocene high stand is more about tectonics than SLR, then much of the alarm of CAGW is not justified. is as convincing as if you had said ‘its complicated and difficult to explain’. Well, I researched the issue with certain detail in the bibliography, and one thing is clear: Although there are plenty of studies on sea level at multiple places during the Holocene, no expert has risked to make a sea level reconstruction. It is an issue that it is not even discussed. If the experts don’t know, then the rest of us should not dare to say much about the issue. Exactly as we don’t know how much of the warming comes from greenhouse gases and how much is natural, we don’t know what part of the observed sea level variability is due to land changes and what part is thermal expansion/contraction and from temperature sensitive land reservoirs. Only people with a political agenda can show certainty about these issues, and I am not one of them. From the inconvenient facts department. The current global temperature situation is the trend thus far for year 2017 is down and I expect this will continue going forward for a number of reasons. I will admit global temperatures still on the warm side and need to go to at least 30 year means , before I get excited to some degree but it has to start somewhere at some time. I think year 2017 is the transitional year to a cooler global temperature regime, how cool time will tell, but down to 30 year means seem reasonable by next summer. One of them being the low solar environment . Note solar activity has picked up of late which I view as good ,meaning the chances of solar cycle 24 being a very long weak drawn out cycle are better. Global ocean temperatures are +.306 c making no progress to new highs. This is the MAJOR indicator to watch. Along with global cloud coverage, explosive major volcanic activity ,snow coverage etc. Without the aid of an El NINO environment it is kind of easy to see that global warming does not exist. All global warming episodes seemingly being tied to EL NINO’S. Regarding “Is the choice of statistical paradigm critical in extreme event attribution studies?” This is by some of the pioneers of statistical extreme event attribution, defending what is actually indefensible. But Stott et al correctly note that these bogus attributions are responding to great demand. I can hardly wait for the Harvey attribution studies to start coming out. Has anyone seen any? I imagine they will focus on the extreme rainfall, not the frequency. Speaking of which, has anyone done an attribution study on the 12 year hurricane drought? it will take months to confirm what basic physics says. Trust an English undergraduate to know what “basic physics says”. Physics has nothing to do with it. These are statistical analyses using way too short data series to say what is and is not natural. They are absurd, just like claiming to know what the 100 year flood is from 100 years of data. Here in Australia we have Karoly in the trio. He makes occasional sudden public statements of an alarming nature. He used to have the ear of important politicians. His strange eyes confront the TV viewer as prophecies of doom spew forth. It depends on what you mean by a guess. They use frequency analysis (from too short time series) or climate models (which are inaccurate) or a combination of both. The flaws are deep but they are not guesses, just questionable assumptions. Harris County suffered through 16 major floods from 1836 to 1936, some of which crested at more than 40 feet, turning downtown Houston streets into raging rivers. After the tremendously destructive floods of 1929 and 1935, however, citizens clamored for solutions. Estimated property damage in 1929 was $1.4 million, a staggering sum at the time. Losses more than doubled in 1935, when seven people were killed and the Port of Houston was crippled for months – its docks submerged, its channel clogged with tons of mud and wreckage, its railroad tracks uprooted. Twenty-five blocks of the downtown business district were inundated, as well as 100 residential blocks. If ever there was a county in need of flood assistance, this was it. Politically, the timing couldn’t have been better. All across America during the 1920s and ’30s, the federal government was financing huge water infrastructure projects, damming great rivers at a pace no previous civilization could have imagined – converting deserts to fertile farmland with irrigation in the West, submerging farmland in the East to create reservoirs for power. Major projects were funded through the U.S. Army Corps of Engineers, which for years employed the nation’s only civil engineering experts. Houston’s commercial future hinged on its ability to tap into this federal machine, but it needed a local agency to serve as a sponsor. On April 23,1937, after local leaders submitted a petition with dramatic photographs of past flood devastation, the 45th Texas Legislature unanimously passed the bill which created the Harris County Flood Control District. Since the District’s creation, and despite a history of successful flood damage reduction projects and progress throughout Harris County, close to 30 damaging floods have occurred in the area, resulting in hundreds of millions of dollars in damages in just under 70 years. However, after the 1940’s, the Harris County area did not suffer what would be considered a widespread, regional flood, that is, until June 2001. Tropical Storm Allison suddenly formed 80 miles off the coast of Galveston, Texas, on Tuesday, June 5, 2001, no one expected that, five days later, it would go on record as one of the most devastating rain events in the history of the United States. Neither historical data nor weather forecasts could adequately predict this extraordinary storm that, before leaving the area, would dump as much as 80 percent of the area’s average annual rainfall over much of Harris County, simultaneously affecting more than 2 million people. When the rains finally eased, Allison had left Harris County, Texas, with 22 fatalities, 95,000 damaged automobiles and trucks, 73,000 damaged residences, 30,000 stranded residents in shelters, and over $5 billion in property damage in its wake. Leaving 31 counties with declared disasters in Texas, Allison went on to spread disaster declarations to Louisiana (25 parishes), Florida (nine counties), Mississippi (5 counties) and Pennsylvania (2 counties). Allison was the costliest tropical storm in the history of the United States. So 60 years of manageable flooding. Since 2001 there has been no drought in flooding in Houston: Allison; Ike; Memorial Day Flood; Tax-Day Flood; Harvey. When I read “Rainfall intensities have increased in a warming world, but stream flow has actually decreased” I have to admit it almost pegged my BS meter, especially after they tried to explain it. Simply stated it implies that they figured out how to ‘optimize’ the rainfall intensities but forgot to include matching stream flow. We do not have historical data on rainfall intensities, but we have lots of stream gage data. They are making stuff up. In fact gage data for small watersheds may be the best way to estimate intensity. But intensity is very local and highly variant at every point. Climate science today is largely a game of statistical games. A tournament. It’s hard to do attribution studies on stochastic events. Though it seems that the door to the gulf for the cape verde storms is open this season. I have a dollar that says the current cat 3 drought for US land-falling hurricanes will be less than one month. Don’t knock yourself out with that breathtakingly risky bet. Of course you have had 11 years to rehearse it so you should be able to repeat it in your sleep. It’s amazing you think the skeptical arguments are so weak that I could rehearse counterarguments in my sleep. 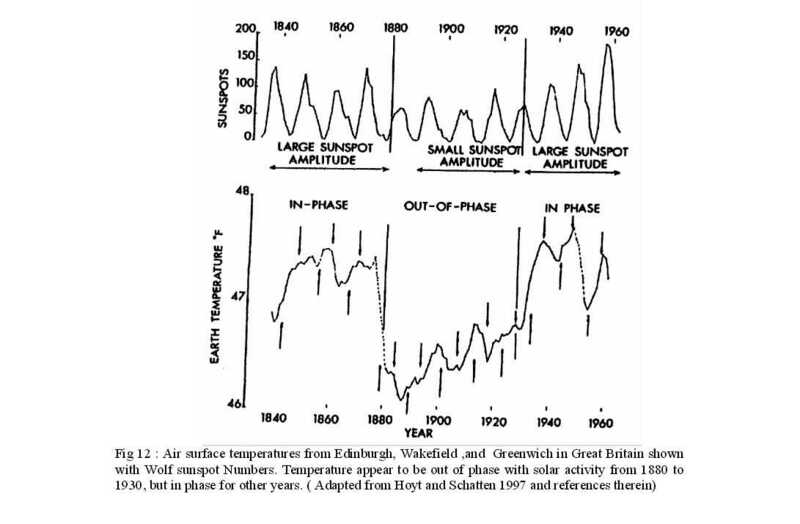 UK temperature anomalies experience a phase change in respect to sunspot cycles in the same manner that the AMO does, but of the opposite phase. This rules out a Hale influence. Are they serious? the MWP apparently had >100 ppm less CO2 than now. I don’t see how that could create a long cycle, and Hamlet’s Mill is only 794.37 years long. “Assessing climate change impacts on extreme weather events: an alternative (Bayesian) approach” looks wild. It is by Mann, Oreskes et al so no surprise. It is pay walled but the abstract seems to say that they are factoring attribution into forecasts. Truly strange. I suspect it is mathematical garbage with a strong dose of heuristical warmunist thinking. Bayes theorem calculates the probability of something given the probability of something else that is related. Formally, P(A|B)=[P(B|A)*P(A)]/P(B). The prime example is correct positive breast cancer diagnosis given the sensitivity (0.8) and specificity (0.9) of mammography. Confirmed by biopsy, only 7.5% of women with a positive mammogram actually will have breast cancer. To verbally rehearse the example, about 1 in 100 women age ~40 will be diagnosed with breast cancer. That is 10 put of 1000. But the sensitivity os only 0.8. So 8 of those 10 will be detected by mammogram. Of the other 990, the specificity insures there will be ~99 false positives. So the true positive mammogram detection rate is (8/[8+99]) or 7.5%. As the probability of something else becomes more certain (a revised prior), so does the probability of something (Baysian posterior). In this example, the key prior to improve is specificity. The only way this well established math could make sense per the Mann/Oreskes abstract (won’t waste money on the paywall) is if attribution of CO2 to climate change becomes more certain, then extreme weather forecasts become more certain. This makes zero sense for at least two reasons. The former attribution prior is not (yet) a knowable probability at all, as the warming from 1920-1945 omparable to 1975-2000 but NOT attributable to CO2 makes clear. Our knowledge of attribution is not increasing, as the pause makes clear. Attribution is only an ill informed belief. And even IPCC SREX could find no probable connections between that guess and observed weather extremes, let alone forecasts about those extremes. Weather does not equal climate except in the very long run over more than 30 years per WMO definition. As usual any time a left wing rag like NYT covers asserted global warming, it is dumbed down to the lowest common denominator. Since Bangladesh is referenced and has become a poster child for the apocalyptic future let’s concentrate on some facts. First, the country’s population has gone from 30,000 in 1900 to 165,000,000 today. Just since 2000, the population has grown by 40 million. The country has 230 rivers. Of the total area, 80% is considered floodplain. It’s river systems drain an area 12 times the size of the country. On average 18% of the country is flooded. Monsoons and massive flooding is not new to Bangladesh. Documentation exists identifying major floods back to 1787, which was the worst for the 18th and 19th centuries. The World Bank said there was no upward trend in flooding. Some studies have found no increase monsoon flooding. However, the land has changed. Deforestation in the feeding watersheds has occurred. Construction of dikes and roads, altering reservoirs, destroying wetlands and general changes in land use and environment have exacerbated the natural flooding that goes on in the country. And when there are 165 million more people than 100 years ago, in a country that is 80% floodplain prone to millennia of monsoons, it is to be expected that there will be deaths, regardless of attribution. Always, always when I read a global warming story in the Grey Lady, the first thing I do is to seek out facts. The story, without fail, is always more complicated. did you really mean 1900? or did you merely mean the land that has since become Bangladesh? My mistake. It was 1900 but I misread charts. Should have been 30 million. The subjects of this paper frequently appear in climate-related blogs: CFD in the case of jetliners and safety in the case of nuclear power. It’s an interesting read. Publics and policymakers increasingly have to contend with the risks of complex, safety-critical technologies, such as airframes and reactors. As such, ‘technological risk’ has become an important object of modern governance, with state regulators as core agents, and ‘reliability assessment’ as the most essential metric. The Science and Technology Studies (STS) literature casts doubt on whether or not we should place our faith in these assessments because predictively calculating the ultra-high reliability required of such systems poses seemingly insurmountable epistemological problems. This paper argues that these misgivings are warranted in the nuclear sphere, despite evidence from the aviation sphere suggesting that such calculations can be accurate. It explains why regulatory calculations that predict the reliability of new airframes cannot work in principle, and then it explains why those calculations work in practice. It then builds on this explanation to argue that the means by which engineers manage reliability in aviation is highly domain-specific, and to suggest how a more nuanced understanding of jetliners could inform debates about nuclear energy. Reads like sociology mumbo-jumbo dressed up to me. As soon as I encounter the word “problematic” in a paper I’ve got a good idea what I’m dealing with. Sorry, a PhD in “Science and Technology Studies” is for people not bright enough to be either a scientist or an engineer. It’s a non-subject, and to the extent it is a subject, it is best practiced by scientists and engineers because they understand the topics they’re pontificating about. But the Gulf Stream has not slowed while the AMOC has, so where is the warm GS flow going if the overturning is reduced? 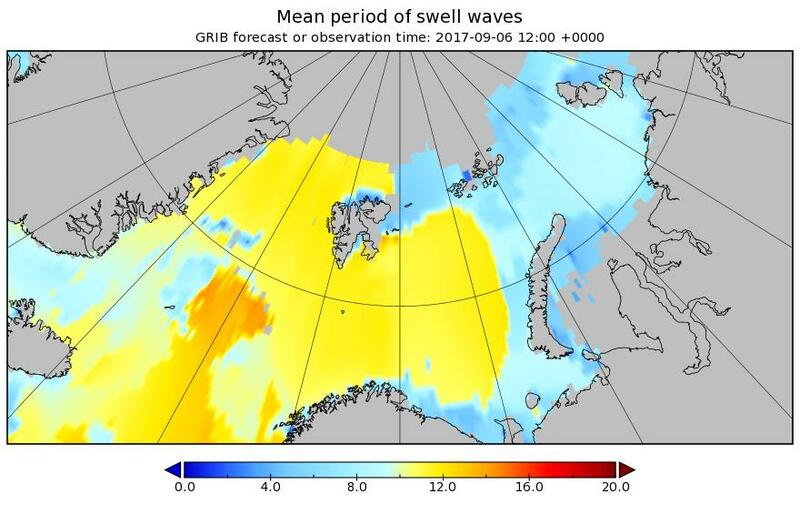 Moreover, we know that the AMO shifted to its warm phase since 1995, together with the acceleration of sea ice loss, at down to annual and seasonal scales. Calling Arctic humidity events an ‘Enhanced wintertime greenhouse effect’ could be misleading where they are driven by negative North Atlantic and Arctic Oscillation episodes, there’s nothing in the climate models saying that AGW will increase negative NAO/AO. Don’t see why this is in moderation?? I don’t see how 239 watts/sq. meter are coming in (in ASR) and 239 watts/sq.meter are leaving (in mostly OLR) and we can have the equilibrium of this energy input and outgo render totally different surface temps?. Is the theory saying that the 14u photons are being hung up and leaving energy in water molecules at 33,000 ft on the way out? If so, this layer should warm. It’s like saying that an electrc iron, consuming 1000 watts. can have two totally different operating temperatures depending on where in the structure of the iron the heating filaments are located. The temperature profile within the iron is dependent on the location of the heating filament. We are within the radiating body. If the energy of the 14u photons is doing work somewhere, in some layer, it has to be kinetic or potential. Where do we have evidence this is occuring? And if so, this is going to chsnge the 239 watts/sq meter leaving. The energy leaving has to be exactly that entering, doesn’t it or we would be dead in a few hundred days? There is a small imbalance: more E in than out. It is accumulating in the oceans, mostly in the southern, so it’s not going to kill anybody in a few 100 days. The atmosphere itself doesn’t provide extra heat, like an insulator doesn’t. It prevents heat from escaping the surface. The more insulation effect, the warmer the surface, and the warmer the surface, the warmer the atmosphere via convection. The warming of the atmosphere is indirect via its own insulation effect. As in a house, insulation is passive, but adding it makes the house warmer for a given heat source, which is the sun’s heat in the case of the earth. On the contrary, GHGs capture energy in the atmosphere and distribute it to the atmosphere. Surface warming follows when some of this energy is once again captured by GHGs and then radiated downward. It is nothing like an insulator. Most importantly, the surface cannot warm by this mechanism unless the atmosphere first warms. This is why the satellites falsify the surface statistical models. Horse manure. According to the silly energy balance diagram you posted, there is 341 W/m2 of solar radiation at the TOA. Adding up the arrows in the diagram that strike the ground, there is 517 W/m2 of energy. Presto, through the magic of voodoo climate pseudoscience, the atmosphere acts like a giant magnifying glass. 341 W/m2 at the TOA is all you get. There is no magic energy source below the TOA. That would be a violation of the first law of thermodynamics. Figures 10.9 and 10.8 will be all you need to see. Hope this helps. So, as I said, no, the GHGs don’t heat the atmosphere directly by radiative effects. they insulate the surface, which warms and heats the atmosphere via convection. The direct radiative effect is one of cooling. Also check out radiative-convective equilibrium, where it is an equilibrium between radiative cooling and convective heating. You are ignoring the fact that there is only 341 W/m2 available at the TOA. There is no energy source below the TOA. Simple as that. Science of Dumb, er, I mean Doom, is a horrible reference, and may be the source of your confusion. Yes, it is heating the surface not the atmosphere directly. Did you follow that the net longwave effect IN the atmosphere is one of cooling? Science of Doom is just one place to find out the longwave cooling rate profile. You can search it out yourself. You won’t find anyone, even skeptics, saying it has a warming profile, because that would be counter to radiative transfer theory which is basic physics. Trenberth, you, Science of Dumb ignore basic thermodynamics; namely the First Law. The so-called energy balance diagram is creating energy out of nothing. You are magnifying 341 W/m2 at the TOA to a value of 517 W/m2 at the surface. Not possible. You’ve created a perpetual motion machine of the first kind, where energy output exceeds energy input. Are you one of those green dragon people? Did you notice that the energy balance exists if you don’t ignore any terms at the surface, as it does for the atmosphere itself, as it does for the top of atmosphere? It is all about the energy balance. The atmosphere provides an insulating component to it. Insulators don’t add an energy source, nor do GHGs. They affect the flow and block the outward flux from the surface. Exactly – then think it through! You need to apply another dimension …. that of time. 340 W/m2 at TOA cannot get out in the same instant. It has delay- the GHE. SO what happens, say, if you join a motorway queue in a stream of cars arriving at the back while at the front they are leaving at a slower rate? So each car is a packet of energy, 340 of them arriving at the same rate, whilst 336 of them are leaving (GHE). The queue lengthens (has more W/m2). There is simply a delay whereby energy accumulates. Energy is not created (nor crucially can it be detroyed) – just conserved. Jim D, regarding your “nope” reply. Is Mosher now coaching you? “Nope” is not a counter argument. It is not even a rational response. Nope to what? It was just wrong. Infrared has a cooling effect in the atmosphere. Check the link I gave later. If infrared is cooling, your argument is wrong? Do you agree infrared cools? If not, show a longwave heating rate profile. Hey David, the satellites do show that the atmosphere is warming, so what was that about falsification again? The 14 micron photons, et al, are striking the CO2 molecules and causing them to shake rattle and roll. This is depositing kinetic energy ( temp increases) and they shake other molecules near them. When they rise it is depositing gravitational potential energy too. This means that at least during transitions, on the way to equilibrium, that more total energy is absorbed as ASR than before. Then, we have T^4 increasing and more OLR is finally leaving the earth….but these two, incoming and outgoing, have to essentially always be equal at equilibrium…because imagine 1% more ASR (absorbed solar radiation) that OLR (outgoing long wave radiation) and you would, in a few hunfdred days have an unlivable atmosphere. CO2 is like making the atmosphere blackish. It absorbs more energy===>gets hotter and then T^4 causes it to dump into space as OLR. The reason GHGs net cool the air is that the emitting to space part is larger than the absorbing from the surface part. GHGs make the atmosphere more efficient at emitting energy to space. This is the larger effect because the difference in temperature between the atmosphere and space is much larger than that between the atmosphere and surface. The other part of the GHG effect is blanketing the surface causing it to be warmer, leading to more convection that then warms the atmosphere. It is a convective-radiative equilibrium that establishes the atmospheric lapse rate. The very fact that power fluxes are denominated in watts, i.e., Joules per second, indicates that the time dimension is already incorporated into the incredible K-T cartoon, which would require an internal power source to sustain the indicated fluxes. In reality, it’s the net cooling of 63 W/m^2 (396 – 333) that is the credible IR power flux. That’s what balances the output of the system to the TOA solar input. It doesn’t help to confuse this flux issue with the analogy of cars parked in a queue, for they do not constantly move with time. They can only represent stored energy (Joules), not power fluxes..
Other analogies are where an obstruction causes a river level to rise. The level depends on the degree of obstruction even though the upstream and downstream fluxes are the same. The other analogy is partially blocking a sink drain with a constant faucet rate. The water level depends on the degree of blocking. For water level, substitute temperature. A greater temperature is required to eject the energy when that energy transfer is blocked. Energy flows are analogous to water flows in this way. I was discussing with someone that Germany’s residential electricity rates indicate the economics of wind and solar aren’t there yet. I checked Hawaii’s rates. How can you do worse than Hawaii? How is that possible? I am guessing they are about at 8% solar. But their fuel has to be shipped in. You have smaller grids and no neighbors to buy from or sell to. Very little hydro it seems. Does anyone agree with Tol that this change took place? So we frame it as helping the most vulnerable to climate change. Who cares about the United States? We’ll be fine. It’s not about the science. It’s policy. What is the relevance of your statements? At 500Ma time scales, plate tectonics is the major factor concerning sea levels at every point on earth. Humanity is as unable to grasp the concept of ‘time’ 5-10k years ago as it is, 3k years ago when natives lived near Vegas or 500M years ago when it was all covered by deep ocean waters. For example, there are many young Christian moderns who believe that the Earth, life and everything were all created just 10,000 years ago based on their interpretation of the Bible’s Book of Genesis; and, Al Gore — minister wanabe turned lifetime politician — isn’t much different. Al Gore actually believes America is capable of changing the weather in our tiny corner of the universe and actually did just that during the last half of the 20th century. I wonder how many JimD posts per year there are. I think he’s using too much energy. If only some of them were something other than a complete waste of time. I did wonder once how he came to achieve protected species status on this forum, but only once. It’s more efficient just to laugh and move on. They’ll feed the additional information into the models to try to narrow the track. Thank you for these weekly reviews. A profound and provocative essay by Michael McIntyre on multi-level thinking and scientific understanding Maybe it’s just that I am old, but I did not find that novel or deep. It seems to be stuff I have read over and over. Maybe you will find this entertaining. Almost everybody believed the global warming CO2 hypothesis in 2006. The evidence appeared to support it. Since then some people have smarten up and learned more. Others not so much. Let’s remember that one of the first people that reported on the pause was Robert Carter, a geologist at James Cook University in April 2006. As our hostess likes to say “You don’t have a leg to stand on”. Only 24% of Republicans to say there is solid evidence that temperatures are rising and that human activity is the root cause. Climategate was an eye opener to a lot of people. This is just a guess but here is what I think. If annual weather related economic losses exceed a certain threshold the people will change their minds, maybe zero out our GDP for a few years would do it. It won’t matter if AGW is real because their perception of reality will have changed. In contrast, if some vital part of the food web collapses or explodes, like plankton or algae then it will have little or no effect because it will be hard to affix a dollar value to the damage to the biosphere. The testimony by Prof. Curry in 2006 could have been presented a week before hurricane Harvey hit and 97% of climate scientist would agree with it’s conclusions. Funny you should mention climategate. Climategate and the Russian involvement in the 2016 elections have a similar look and feel. Do you remember where the climategate emails were released? I think if you go back and check it was a Russian server. The evidence I’ve seen suggests in the end you might get 8%, counterbalanced by (a smaller number of) people who moved in the other direction. Broad public opinion polling that does nothing to inform understanding of causality is susceptible to confirmation bias. If you have more in – depth evidence that shows otherwise, I’d appreciate a link. Sometimes, people project their own views onto the wider public. It isn’t very skeptical. I have been reading this – as well as well as some blog reactions. The essential criticism seems to be that they used only 6 long term proxy records – and that there are no internal variations. It is all volcanoes and solar variability instead. I am not much of a believer in cycles. It is all control variables and standing waves in Earth’s chaotic flow field. Control variables trigger shifts in ocean and atmospheric states – which in turn modulate energy balances through changes in cloud, ice and vegetation. Including in the past few decades. The data is unmistakable. The conclusions seem utterly unremarkable as well. A shift in climate state added to late 20th century warming – but climate shifts are utterly unpredictable and potentially as extreme as any in the deep past. The usual state of incomprehension is that state shifts don’t exist or that ‘cycles’ implies less warming going forward. It astonishes that the breadth and depth of this science just hasn’t clicked with any of you. The methodology is very interesting. It is a vast improvement on the temporal chaos of climate models. Sine waves emerge from spectral analysis – and network math is the only feasible approach found thus far for spatio/temporal chaos. Real world climate data persists for a while and then abruptly shifts – even at the scale of decades. There are many control variables and a wide range of planetary responses. Even at the scale of minutes to hours – because chaos happens from micro eddies to planetary whorls. 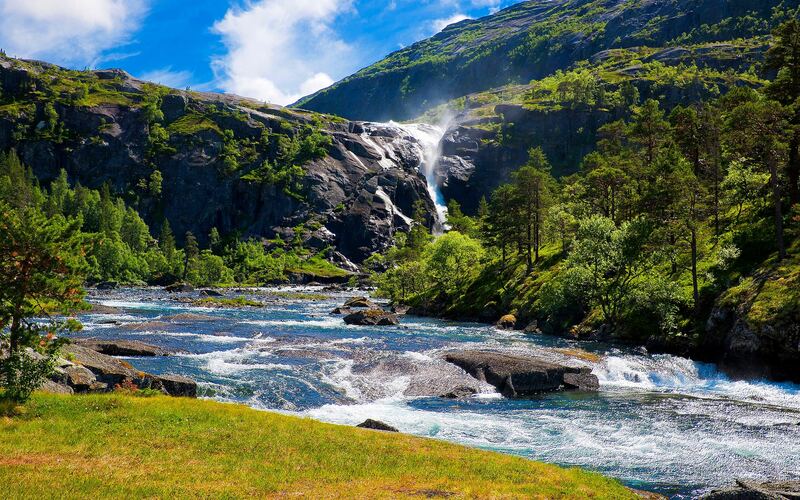 In the mountain river – as much as the planet. This is moisture in the atmosphere over the Pacific – in an almost real time supercomputer visualization. A rain gauge is a temperature proxy as good as tree rings. I am not much of a believer in cycles. It is all control variables and standing waves in Earth’s chaotic flow field…The data is unmistakable…It astonishes that the breadth and depth of this science just hasn’t clicked with any of you. Ironically, most of what has been deduced in practice about control variables and waves in chaotic flowfields is the result of applying spectral analyses of one kind or another to the data. Not surprisingly, those who merely read and regurgitate words without understanding the purpose and scope of spectral methods simply fail to connect the dots in geophysics. It is more observation of turbulence in spatio/temporal chaotic flow fields – than spectral analysis. Also – very long term hydrological data. Famously – Hurst and the Nile River. It is more observation of turbulence in spatio/temporal chaotic flow fields – than spectral analysis. Once again, there’s no connection of dots by an analytic amateur unaware that the turbulent structure function is essentially a spectral specification. There are no dots – certainly nothing that John says makes any case for anything but dotage. Predictably amusing blather to conceal the fact that the basics of analytic science totally escape self-styled blog-lions. We still do not have a case for anything at all – other than the usual ad hominem. Spectral analysis – using a fast Fourier transform algorithm – gives a set of sine waves of different amplitude, phase and frequency. It is a signal decompostion with no implications for geophysics. It is a signal decompostion with no implications for geophysics. The notion that spectral analysis of chaotic geophysical signals consists merely of applying FFT algorithms betrays an utter lack of comprehension of how such analyses are done, what they reveal, and the role of those revelations in advancing geophysical knowledge. There are several modern texts available on geophysical signal analysis. Instead of indulging in charges of “dotage” while posting puerile obiter dicta, try digesting one of them. Until such time that an inkling of scientific comprehension is acquired, such postings are rank charlatinism. Sine waves as the paper I linked to says. Spectral analysis is widely used in climate science. e.g. An interesting finding here is the change in ENSO tempo that happened at the start of the 20th century. It is a smoking gun for an external control variable for Pacific states. Thais is a good 14 minute video presentation on Geological Time (by Tegan Smith, Geoscience Australia). Damn. I don’t know why the Introduction instead of the Geological Time presentation is showing. I’ll try again. Otherwise, go to Session 2. That’s the wrong one also. I am posting the correct link; I dont Know why the Introduction is showing instead of session 2. I’ll try once more. If the wrong one posts again, open it, expand to full screen and select Session 2 of the presentations shown on the right, or just go forward to the next session. M0sher proves science literacy isn’t required to post a youtube link by posting a youtube link. The website (and magazine) Skeptic.com are devoted to debunking junk science and general superstition. The person who runs the site, Michael Shermer, does believe in man-caused global warming though, and he created a 2 minute video (which was on the front page of the site at least as of yesterday) explaining why. My challenge to you is to make a 2 minute video explaining why he is wrong! My challenge to you is to spend 1000 hours of in depth, independent research which may allow you to understand the extremely complex and nuanced issues involved. I know these skeptics have spent much more time doing that research, which cannot be captured in a superficial video. Study harder. Do the work. It gets more complicated the more you know the facts. Might be worth looking at the correlation with the build up of the Siberian oil boom. Lots of leakage, I expect. Liberals believe science about climate change but not biology about only two genders. Liberals do NOT believe science about climate change. forbush decrease underway,concomitant SSW at south pole. Trump eliminating Nasa earth science division. Yay! My latest analysis. This one is funny. The first paragraphs: “Bill Nye (the so-called science guy) is arguably the leading spokesperson for climate alarmism to the lay public. His YouTube videos are extremely popular, with collectively well over ten million views. But a close look at these numbers says he may actually be promoting skepticism as much as alarmism, maybe even more so. What a hoot! Nye has a number of videos specifically designed to spread the alarmist doctrine. What is especially interesting is that he also has several videos that feature debates with skeptics. Contrary to Nye’s intention, these videos can be used to teach skepticism. This is because a central tenant of alarmism is that there is no debate over their claim that human activity is causing dangerous climate change. Thus a video that shows just such a debate supports skepticism. Is it the PDO or the NAO? Say we have a medium size NAO and a monster PDO. The PDO is huge. It appears by itself it cannot be part of a regime change. There’s a lot going on with the North Atlantic. Sea ice, the variable flow of the Gulf Stream, down welling water and salinity variation.